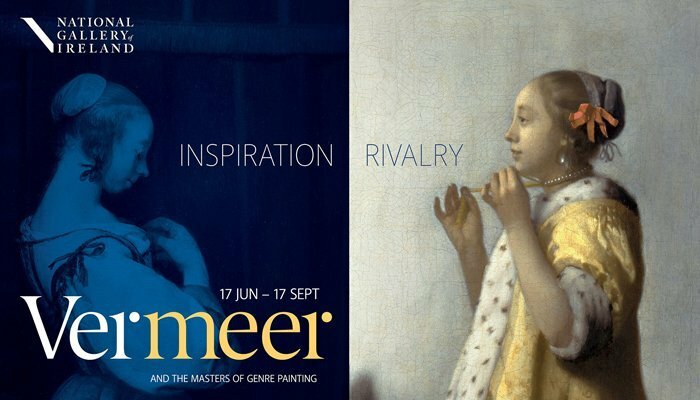 The exhibition will explore the fascinating network of relationships between Vermeer and Dutch genre painters of the period 1650 to 1675, and will give visitors an insight into how Vermeer and his contemporaries admired, inspired and rivalled each other. Conceived by the National Gallery of Ireland, this exhibition will bring together some 60 paintings from around the world. As many as 10 works by Johannes Vermeer (1632-1675) will be included in the exhibition, which represents almost a third of Vermeer's surviving oeuvre and the third highest number of works by the artist ever assembled in the world. The exhibition is organised by the National Gallery of Ireland in collaboration with the Musée du Louvre, Paris, and the National Gallery of Art, Washington. Tickets for the exhibition are selling fast. To learn more about the exhibition and book your tickets visit the National Gallery website. Johannes Vermeer (1632-1675) Woman with a Balance, c. 1663-4 Widener Collection. Courtesy National Gallery of Art, Washington. Zurich is running a competition for one lucky winner to win two tickets to the Vermeer exhibition at the National Gallery of Ireland. To be in with a chance to win answer this simple question: Where is the exhibition taking place? a) The National Gallery of Ireland or b) The National Museum of Ireland. Send your answer to: social.media@zurich.ie. The closing date for entry is the 30th June and all entries will be entered into a draw. T&Cs apply. Closing date for entry will be 30th June 2017. After this date no further entries to the competition will be permitted. There is one prize to win two tickets to the Vermeer exhibition at the National Gallery of Ireland. The prize is as stated and no cash or other alternatives will be offered. The prizes are not transferable. Prizes are subject to availability and we reserve the right to substitute any prize with another of equivalent value without giving notice. The winner's name will be available 28 days after closing date by emailing the following address: social.media@zurich.ie.